At the last Sydney Boat Show, crossing the footbridge overlooking Darling Harbour, it wasn’t the huge mast of Team Australia, the former Orma trimaran Banque Populaire, which immediately attracted everyone’s attention, like a magnet. It was a catamaran ‘just’ 47 feet long. We quickly learned that it was called ‘Ricochet’ and, guided by Franck Hobson, its owner-skipper, we discovered an absolutely superb sailing boat, a genuine work of art, where the word perfection has guided the realization of every square millimeter of deck, every micro-detail of the accommodation. From high up on Pyrmont Bridge, we were firstly struck by the incredibly fluid design. On any other boat, the coachroof’s round portholes with decreasing diameters could appear dated. Here they confirm the impression that here we are dealing with something different, unknown until now, a Un-identified Floating Object. The integral pearl grey paint refines its lines, blends its interior spaces, captures and reflects the light. Down on the pontoon, at the foot of the sugar scoop, we felt almost intimidated! The pearl non-slip seems to envelop perfectly the shapes originally designed by Ian Farrier, assisted by the talented Australian design office, Murray Burns and Dovell (MBD). Since 1989, at Newport, north of Sydney, they have been designing some of the fastest, most elegant boats imaginable: Ricochet is undeniably an eminent representative. All the accommodation has recently been reinterpreted by the designer and interior architect Burley Katon Halliday (BKH Sydney & New York). We were however very quickly put at our ease by Frank’s huge smile; like most Australians, he doesn’t bother with polite conversation. The contact was frank and jovial: welcome aboard! Behind his sunglasses, sheltered by his cap, the little goatee and the haircut reminded us of a certain Sir Richard Branson. Added to this striking resemblance, it turned out that Frank had been the skipper of Necker Belle, the 32m catamaran belonging to the creator of Virgin! But the likeness between the two men didn’t stop there! He too is motivated by the same search for excellence, the same creativity, the same attention to detail. Moreover Frank called on the suppliers of Necker Belle to realize and equip Ricochet: the guarantee of achieving exceptional levels in all areas. 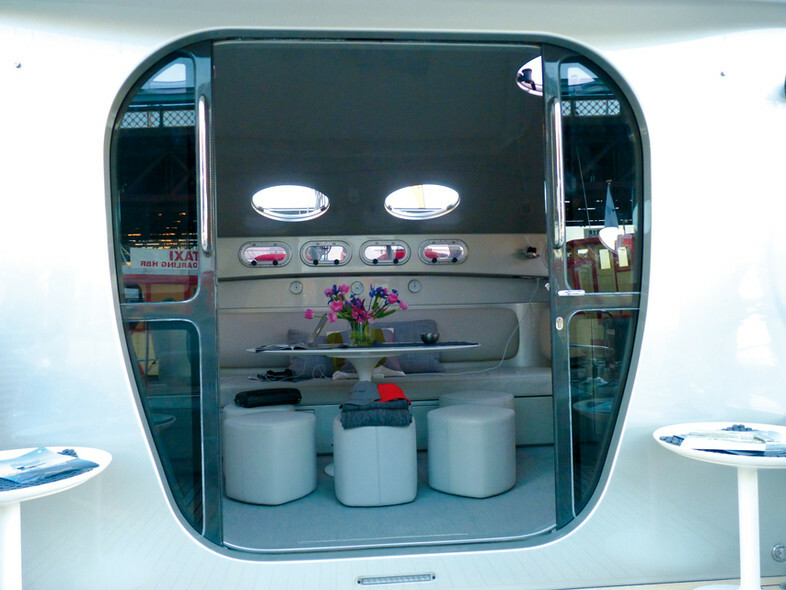 The saloon doors retract into the coachroof bulkhead. Welcome aboard!